Bearing and Leadership/Followership. Navy and Marine Corps leaders must be able to give and receive orders clearly and professionally; whether as OOD of a ship or commander of a platoon, one's orders must be given with a good "command voice." Close-order drill is a great way to practice this. Fun. Is "fun drill" an oxymoron? Well, it can be fun when you get it just right, a cool feeling when the musical rhythm jibes exactly with everyone's precision movements. It's even more fun when you call cadences. Think of it as a game. 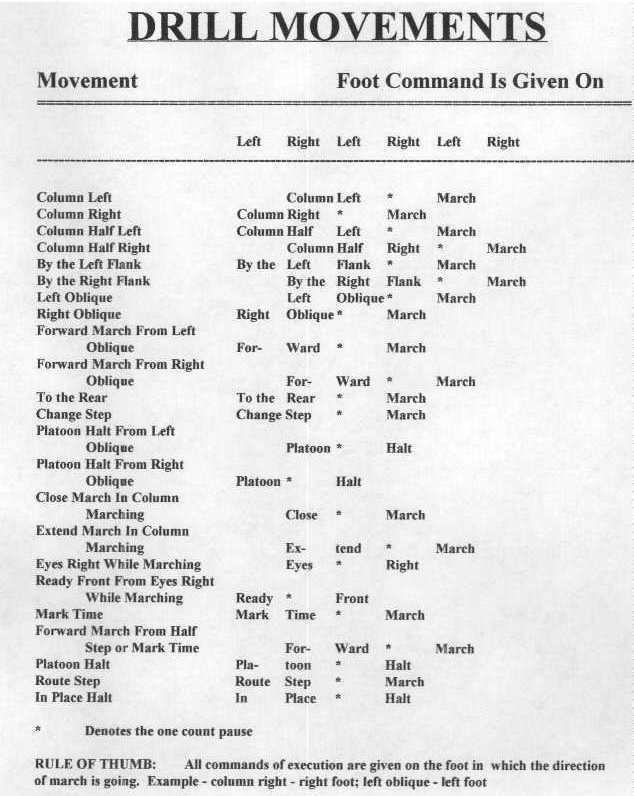 All the commands of execution (usually MARCH!) occur on the foot that you're turning towards. For example, when you do COLUMN LEFT, MARCH! the MARCH occurs on the left foot. Because one pauses a beat before the command of execution, this means that columns and obliques start on the opposite foot that you want to turn (e.g. the COLUMN for column left is said on the right foot), while flanks and half-columns start on the same foot for turning. Why do Drill Instructors sound funny? You may have noticed that experienced Drill Instructors say things like "Harch" instead of "March." There is a method to the madness: consonants like "h" are short and clipped (it's very difficult to draw out, especially with any volume) while other consonants can be elongated (you can hum an "m" or hiss an "s" for quite a while). If you replace the command of execution's initial consonant with an "h" (e.g. "About HACE!" "Forward HARCH! "), you make it easier for everyone to start at the exact same time. When do you put your arm down for dress right dress? There are lots of times (like the first squad on FALL IN, after EXTEND MARCH, etc.) when you put up your arm to ensure good spacing, but only on OPEN RANKS and DRESS RIGHT DRESS do you need to be explicitly told READY, FRONT. In all other cases, the rightmost person drops his/her arm when the person to his/her left has stopped moving, and so on down the line. When marching in a oblique (at a 45° angle), on the command HALT one has to stop facing straight (that is, at 0°, not plus or minus 45°), which means that your last foot has to plant itself at a quarter turn so that when you bring your feet together, they are both facing forward. On the command IN PLACE HALT, you stop at 45° (likewise, MARK TIME continues at 45°). If one has been halted with IN PLACE HALT, FORWARD MARCH means go back to 0° while RESUME MARCH means continue in the direction of the oblique. Yes, it's all a bit confusing, but it makes sense if you think about it a bit. Which foot does PLATOON HALT come on? It depends. Technically, you can do either foot, although it feels better when the command of execution (HALT) is on the right foot...which means that if one elongates PLAH-TOON (à la Parris Island) one starts on the left, and if one does a one-count PLATOON (como San Diego) one starts on the right. My AMOI was from San Diego, so I always used the second method (one syllable "Platoon"). Short answer: start on the right foot, but in a pinch you can do either. Air Force Drill and Ceremonies Manual (AFMAN 36-2203) - Although it has funny terms like "flight" and "squadron" (the equivalent of "platoon" and "company" in the real military), much of it is stolen wholesale from the Marine Corps Drill Manual and thus it is a good reference. Finally, there's a great site called CadetStuff.org which has some humorous articles by "Dr. Drill," among other things. 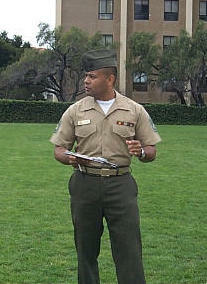 NROTC UC Berkeley Platoon Commanders should check out the drill cards.